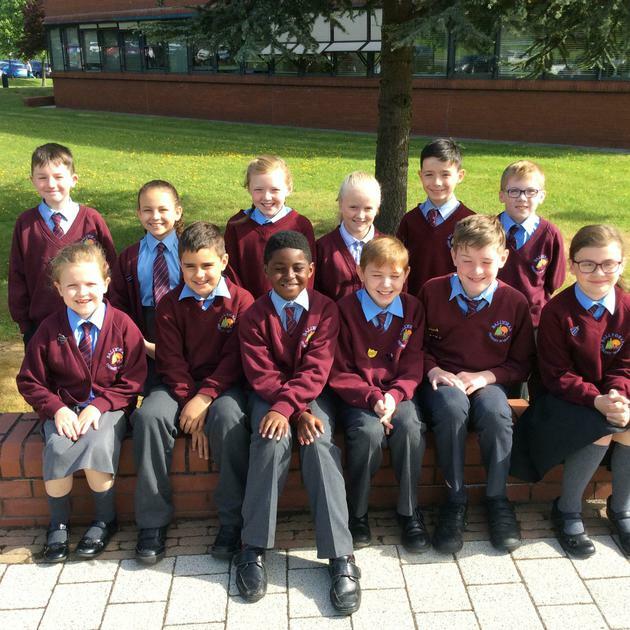 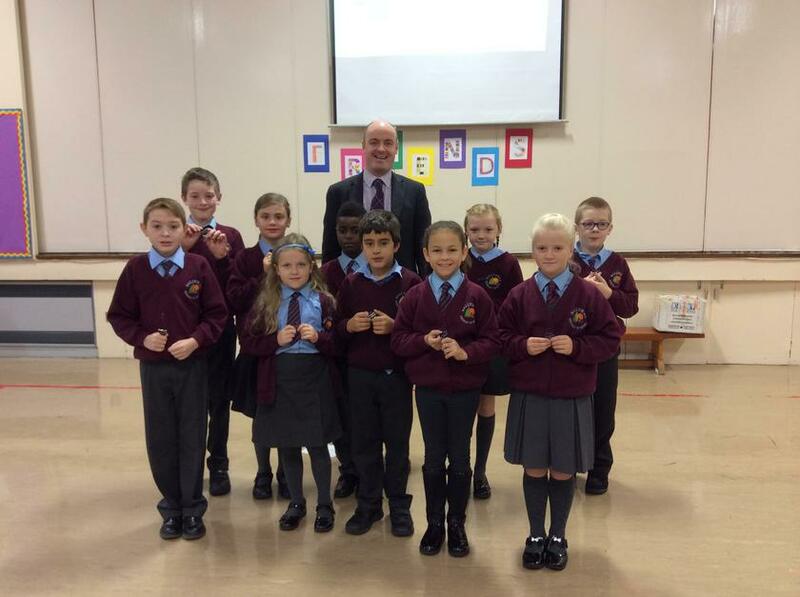 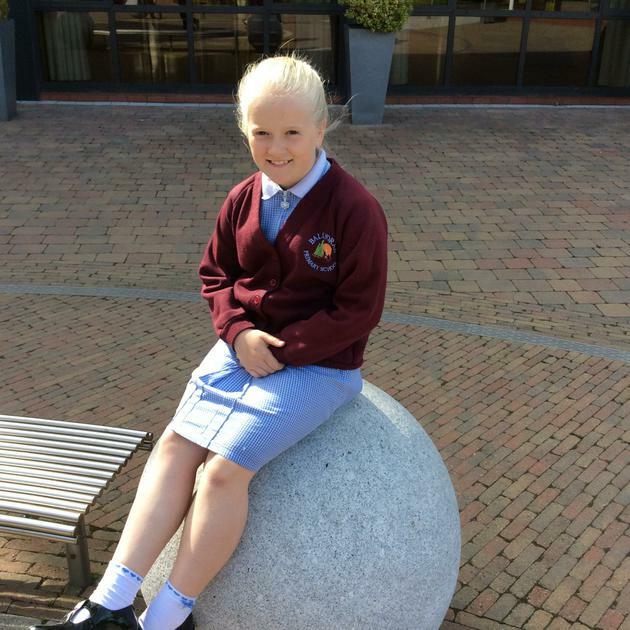 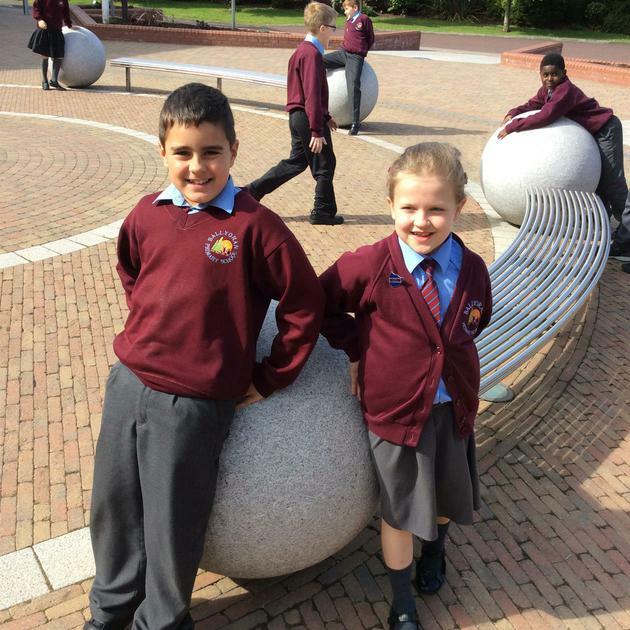 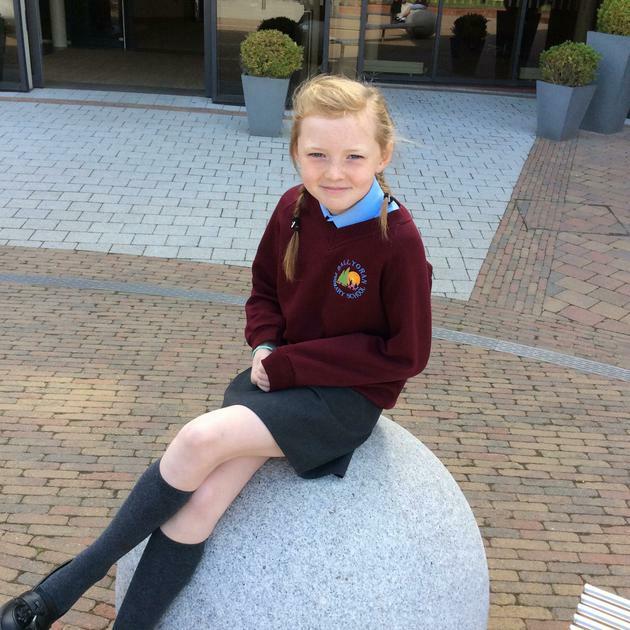 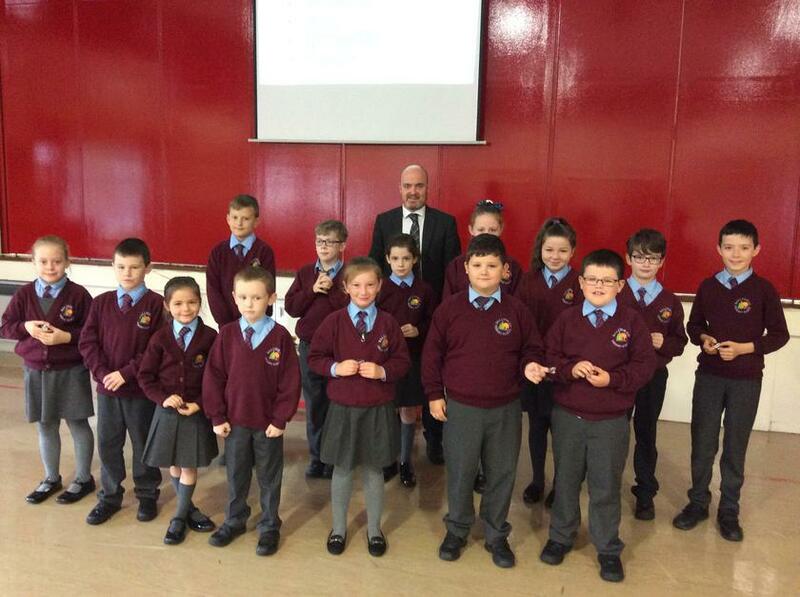 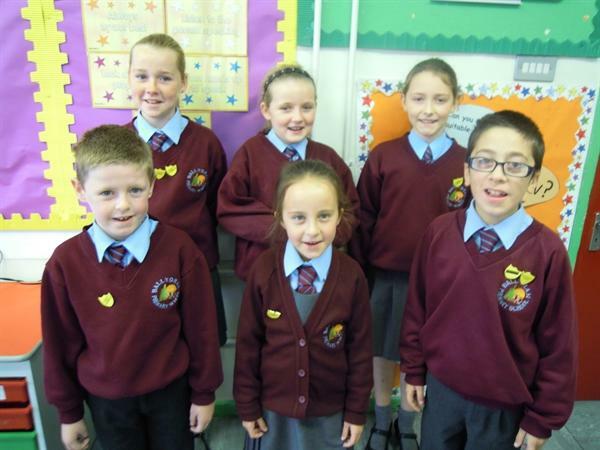 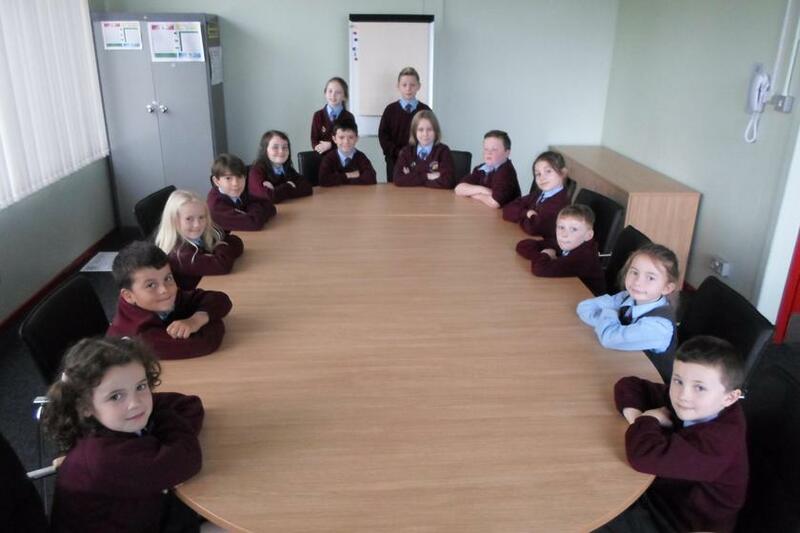 The Pupil Council is a group of pupils who have monthly meetings with the Principal. 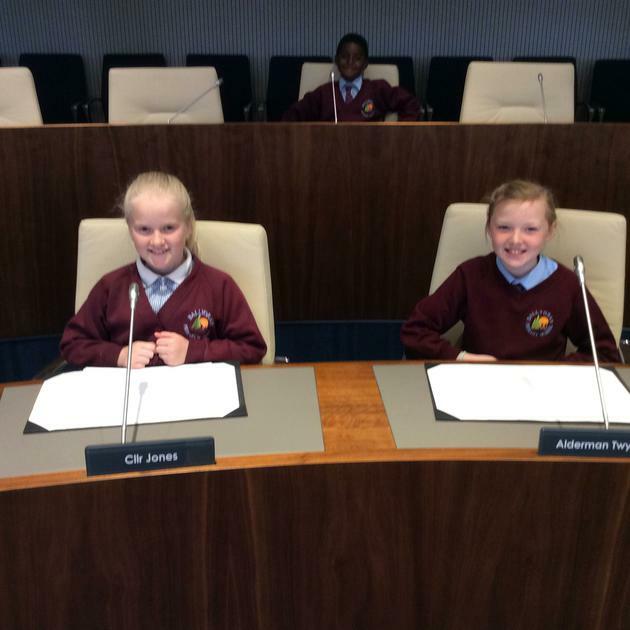 It is made up of two representatives from each Yr 3 -Yr 7 class, one boy and one girl, elected each September by a vote in their classes. 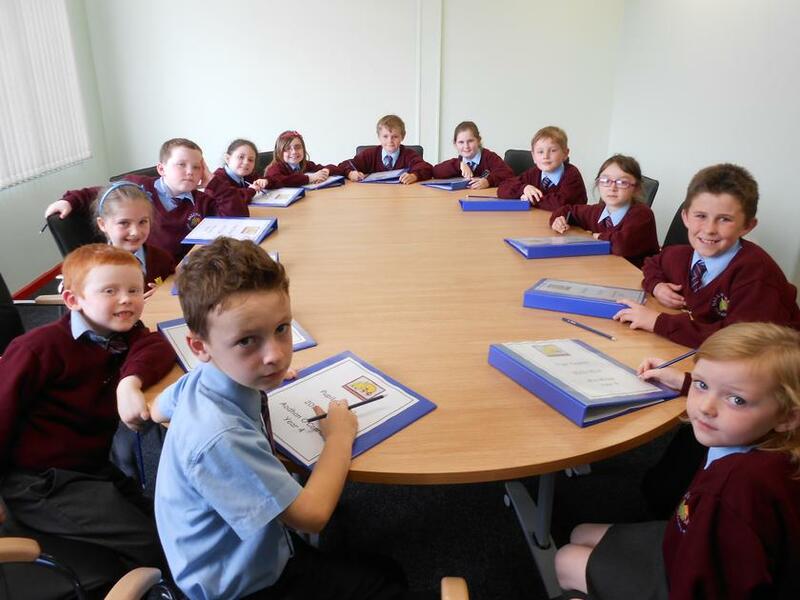 The Pupil Council gives pupils a say in what happens in their school, gives them a chance to put their opinions/ideas forward and gives them responsibility. 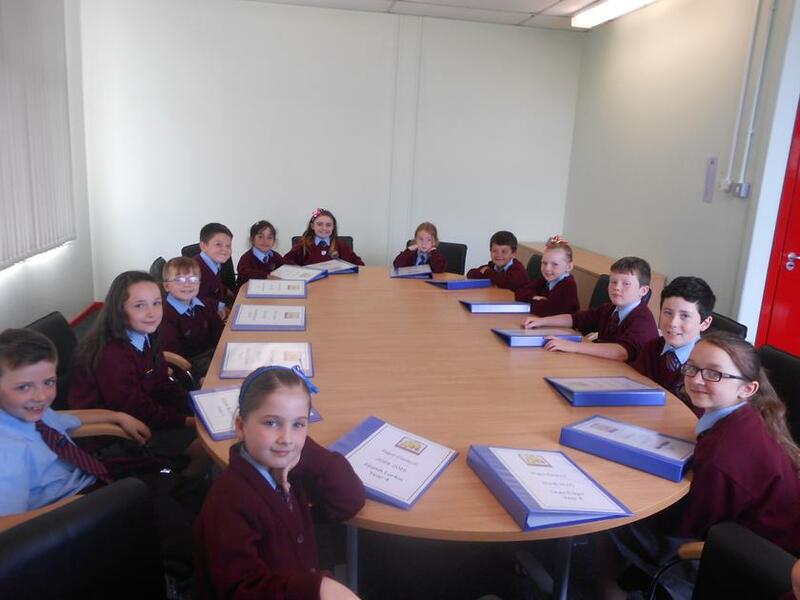 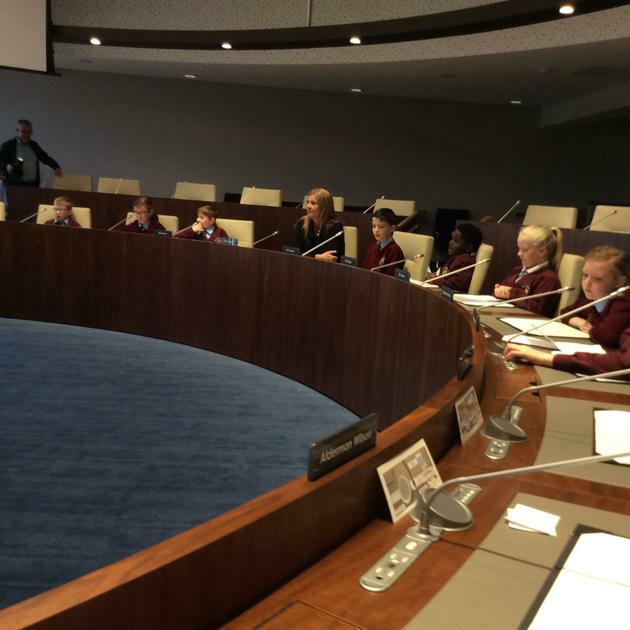 The Pupil Council meets in the Conference Room and the agenda of the meeting is up to the pupils. 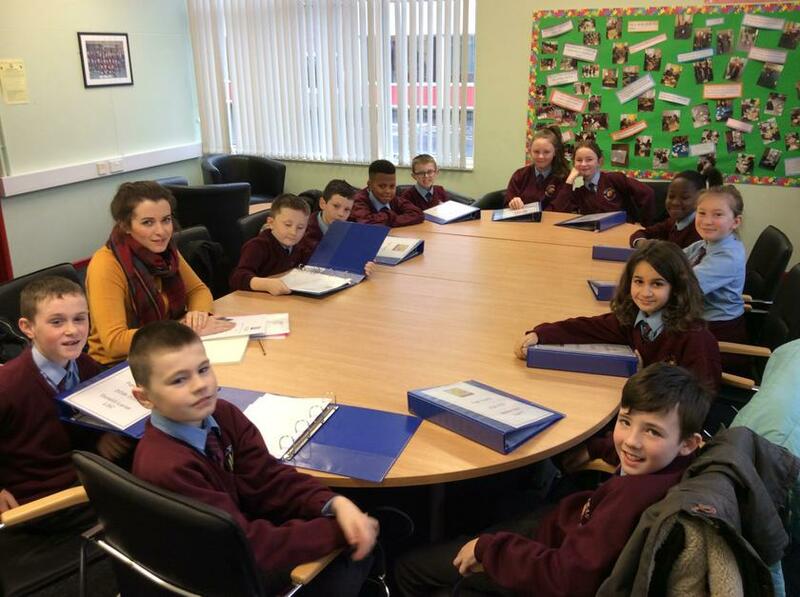 Before each Pupil Council meeting each class holds a Class Council meeting where they can put forward ideas/topics for the Class Representative to bring to the meeting. 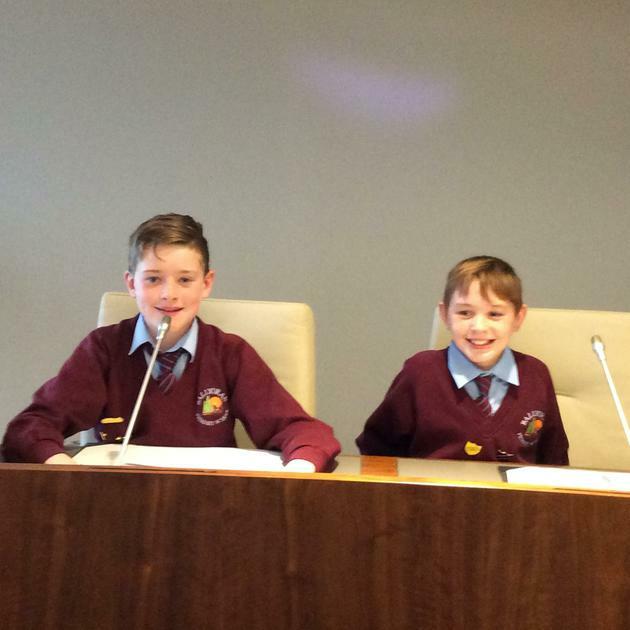 At the first meeting of the Pupil Council each year a Chairperson, Vice-Chairperson and a Secretary are elected by the representatives. 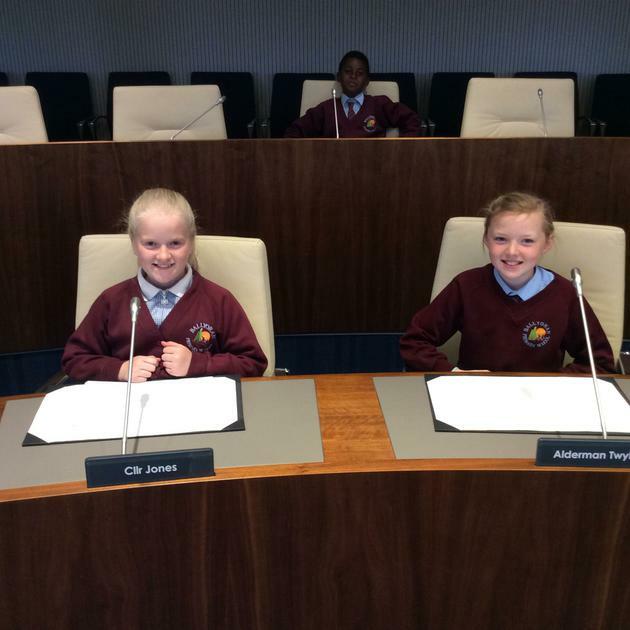 Many good ideas have been brought forward by the pupils and have been acted upon. 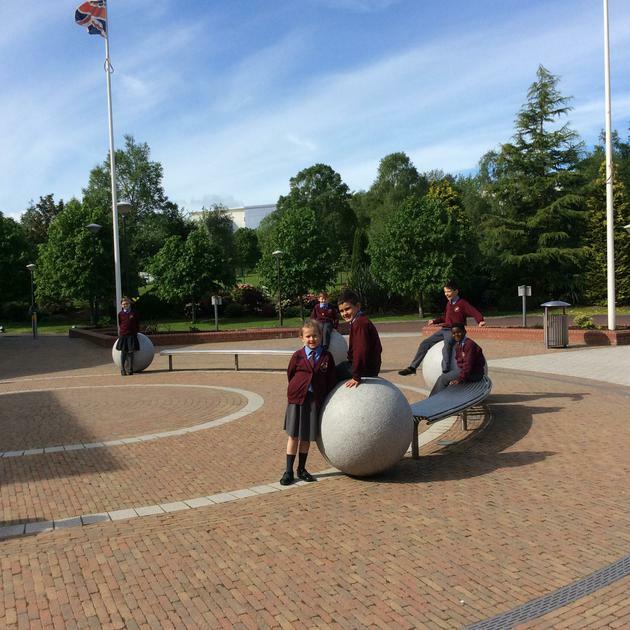 For example, more activities in the playground at lunchtime, a blackboard mounted on one of the walls in the playground, more after school clubs, a new school website. 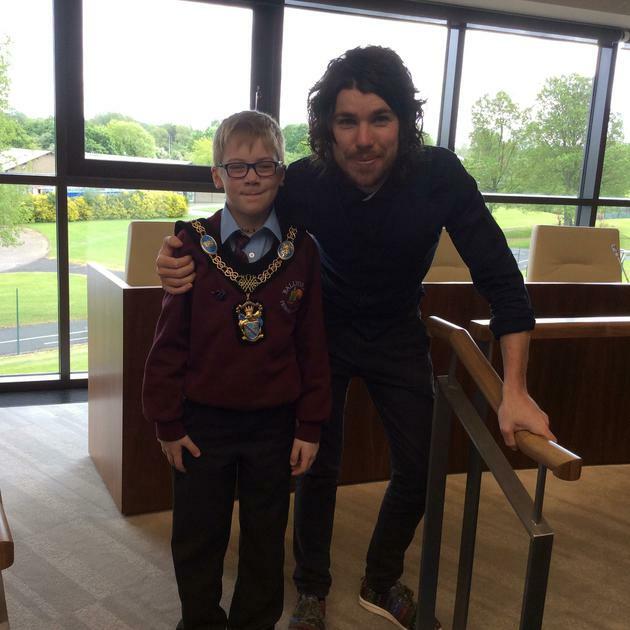 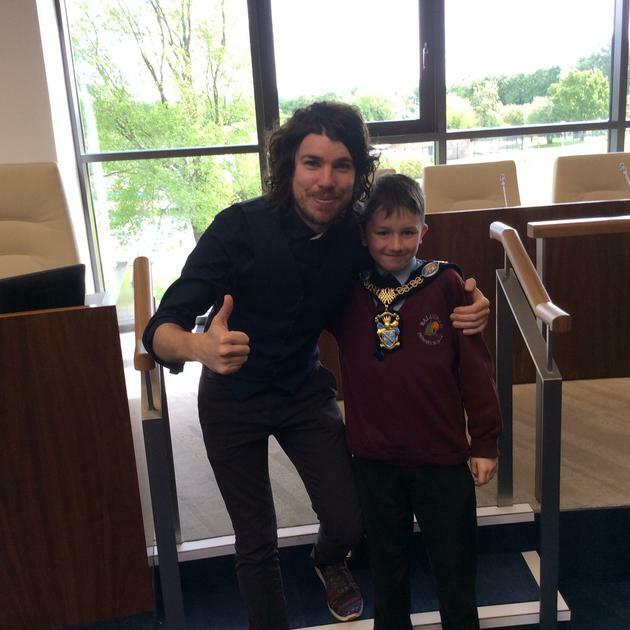 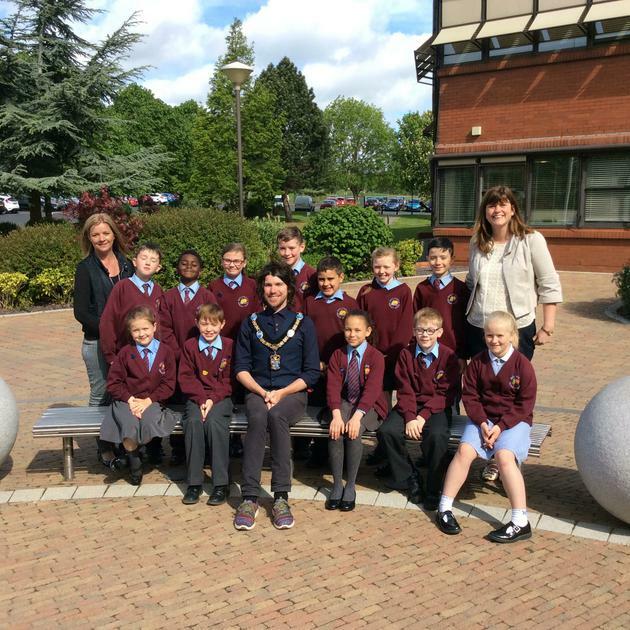 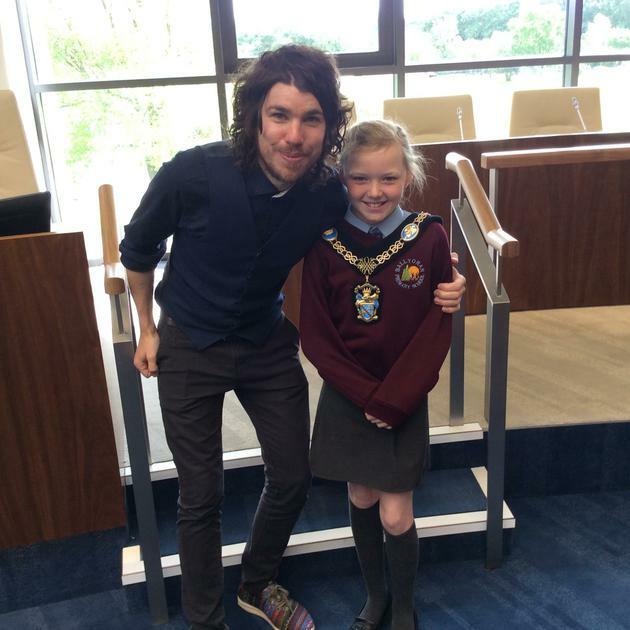 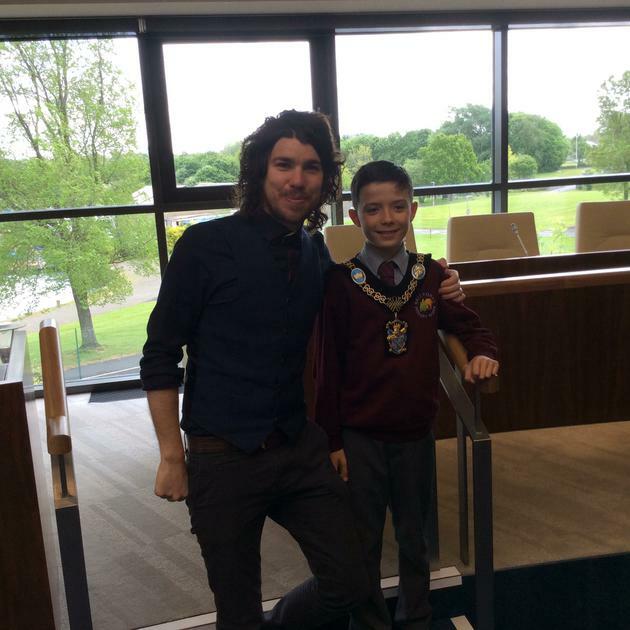 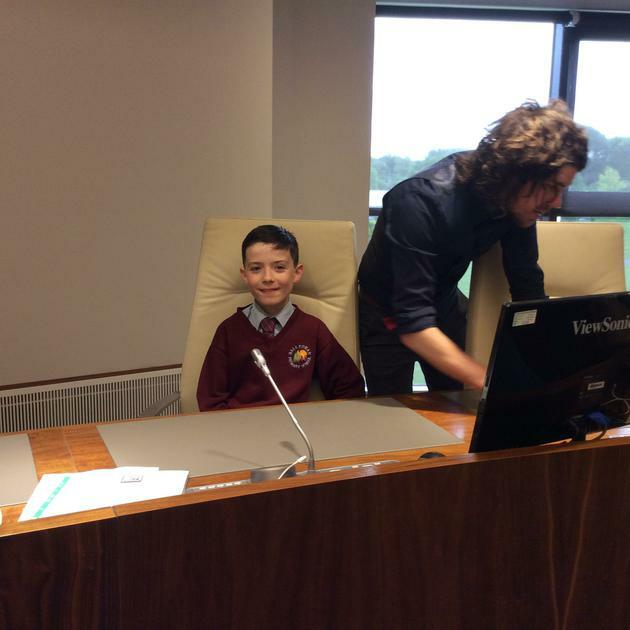 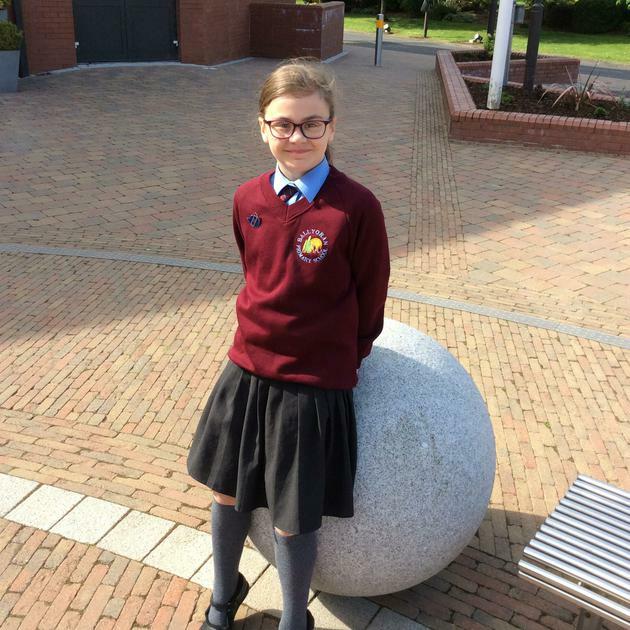 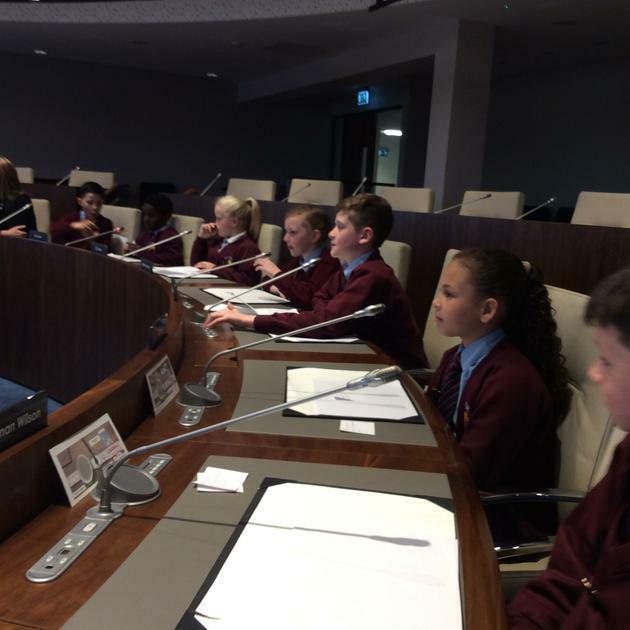 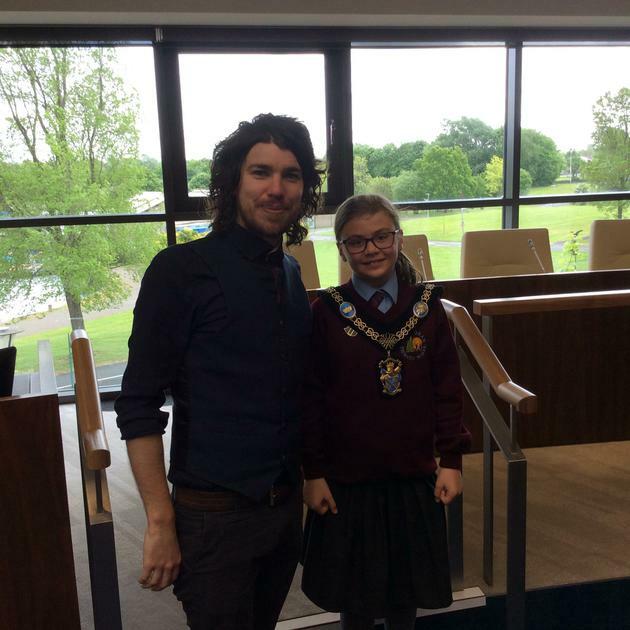 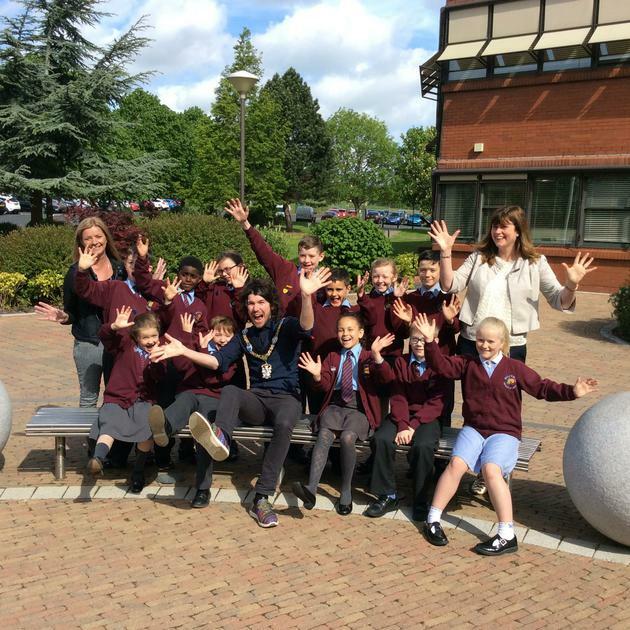 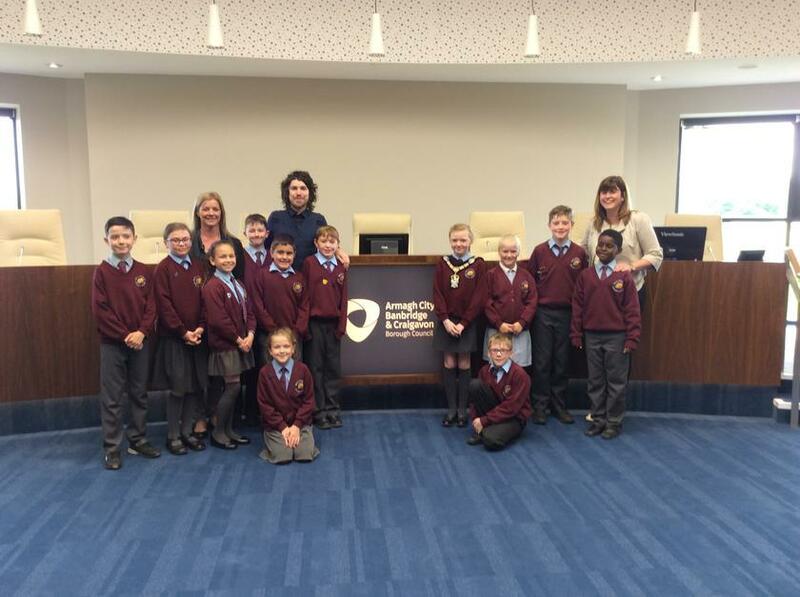 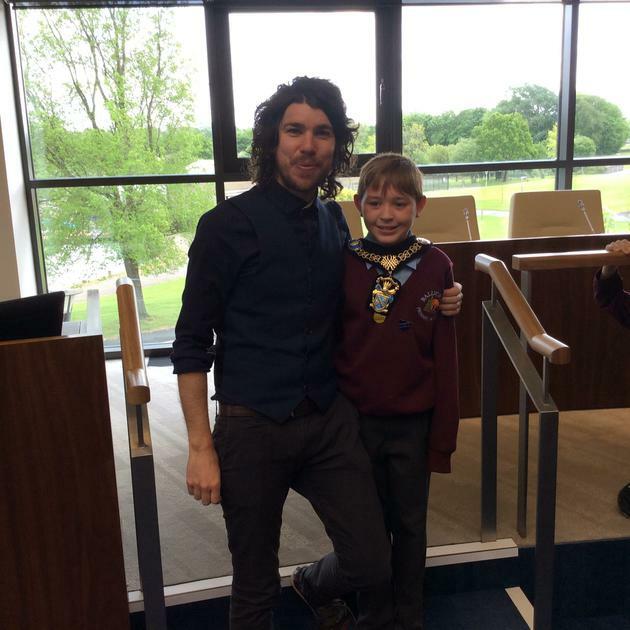 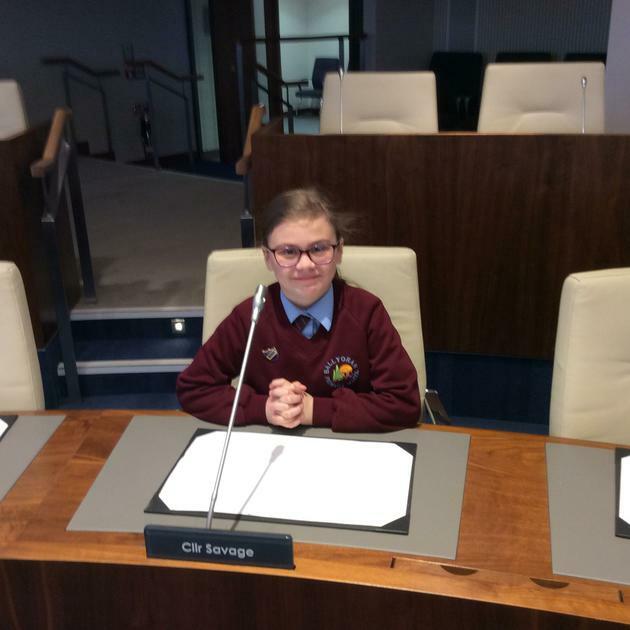 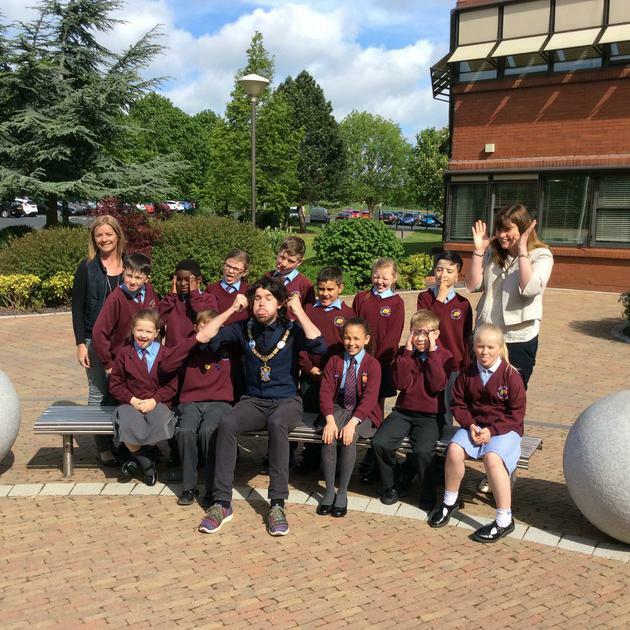 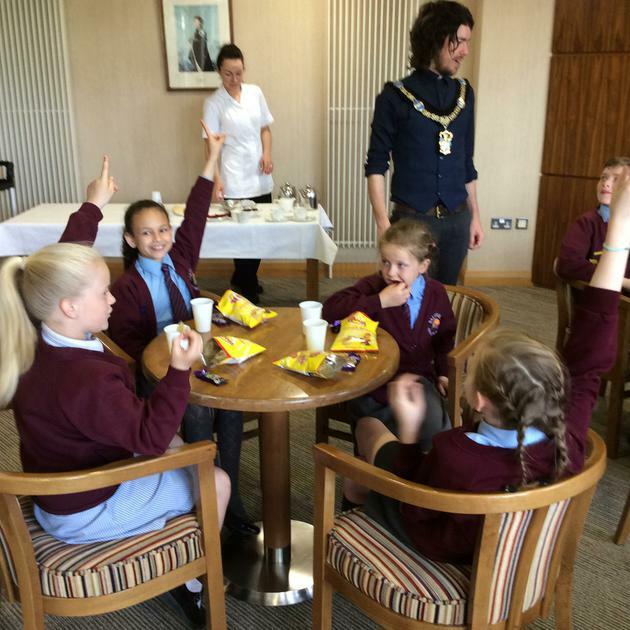 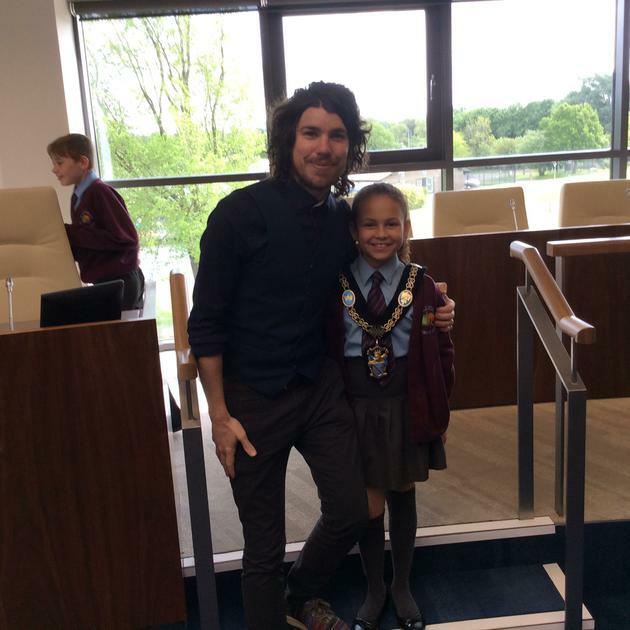 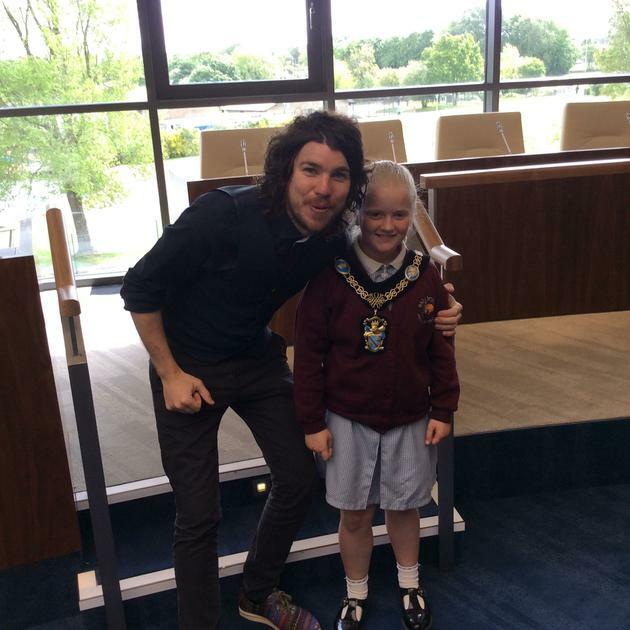 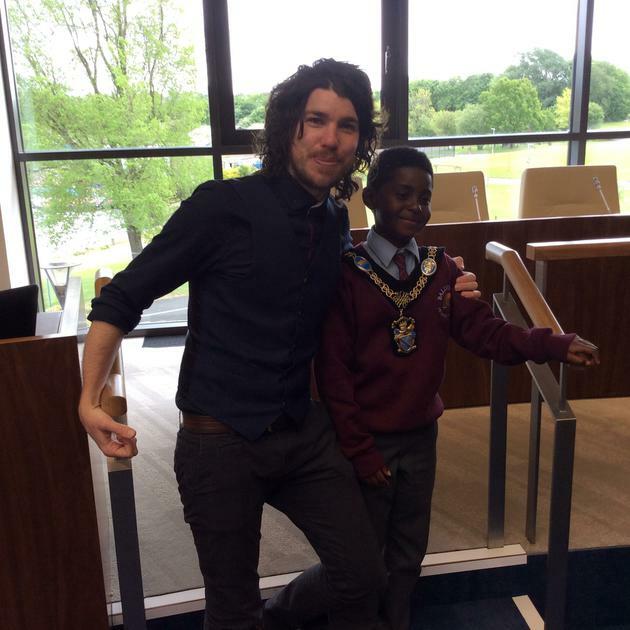 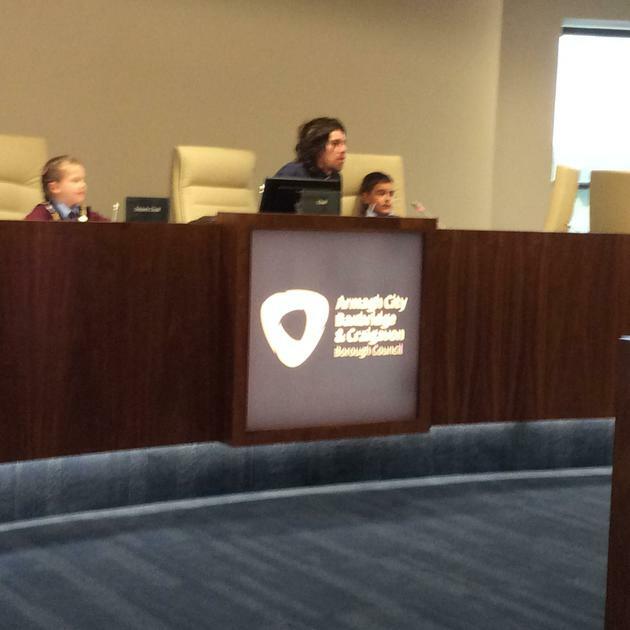 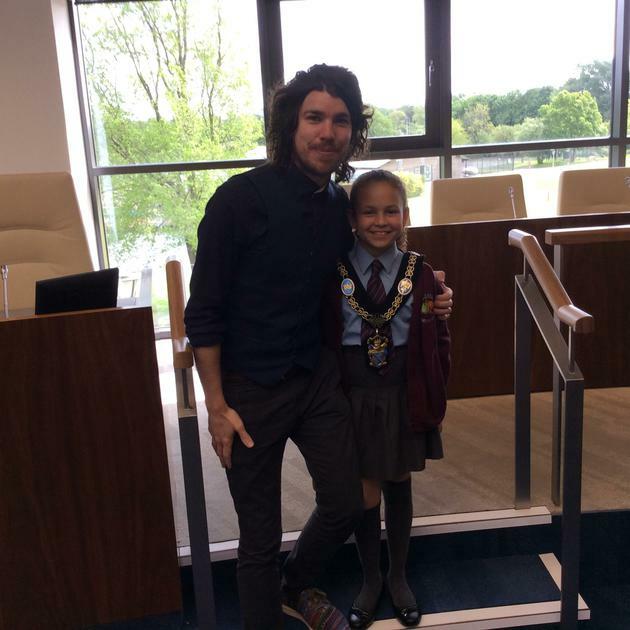 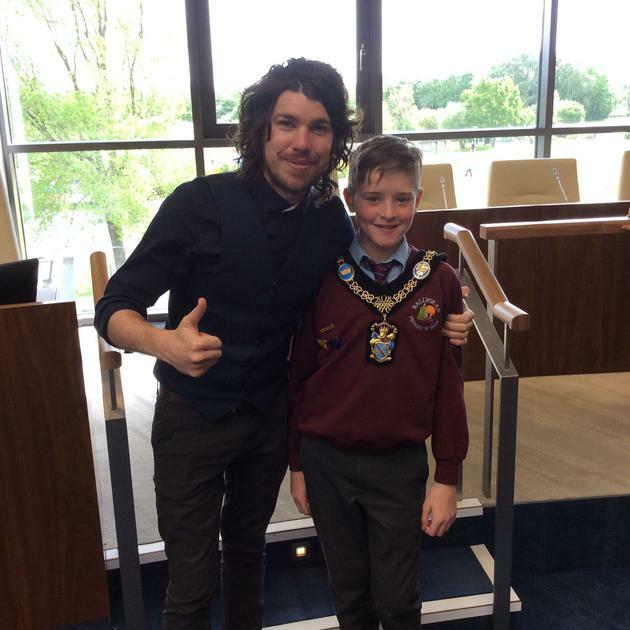 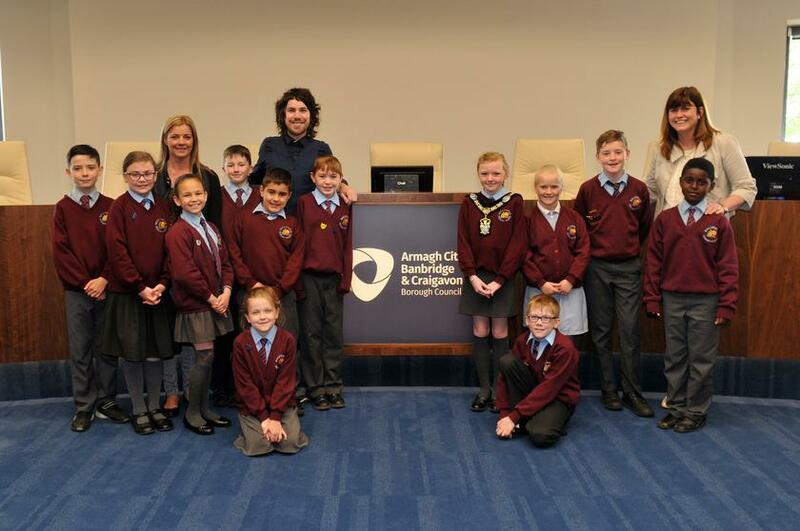 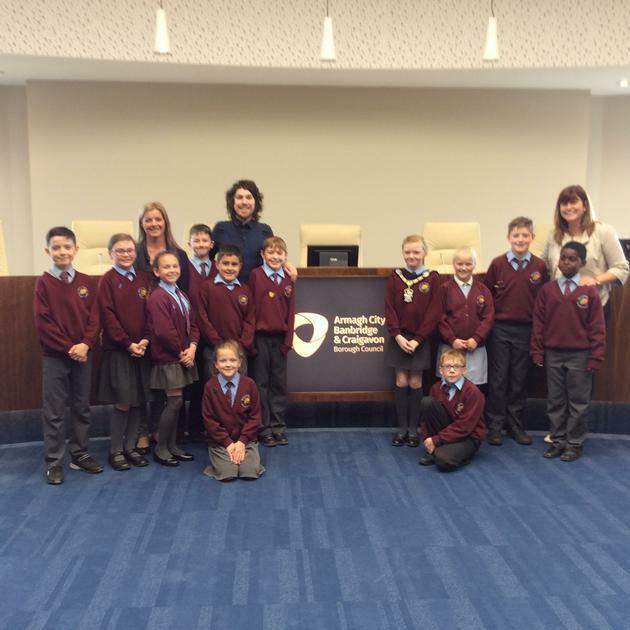 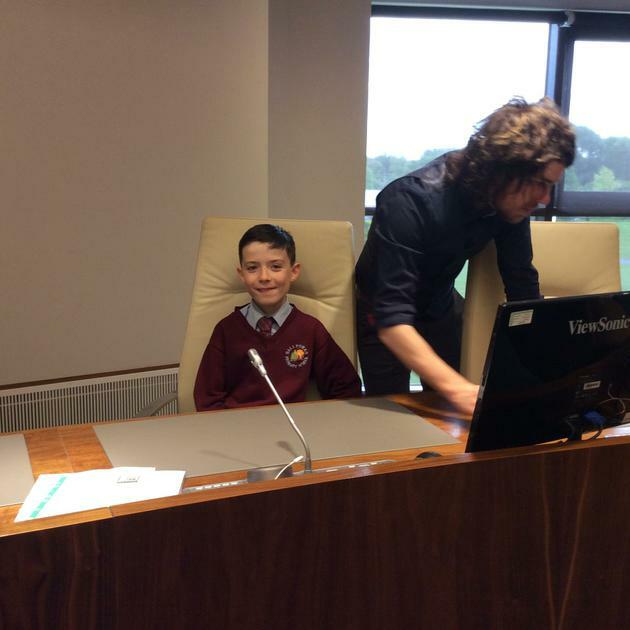 On Wednesday 17 May, 12 Pupil Council members, Mrs Martin and Mrs Fox went to meet the Lord Mayor of Armagh, Banbridge and Craigavon in the Civic Centre. 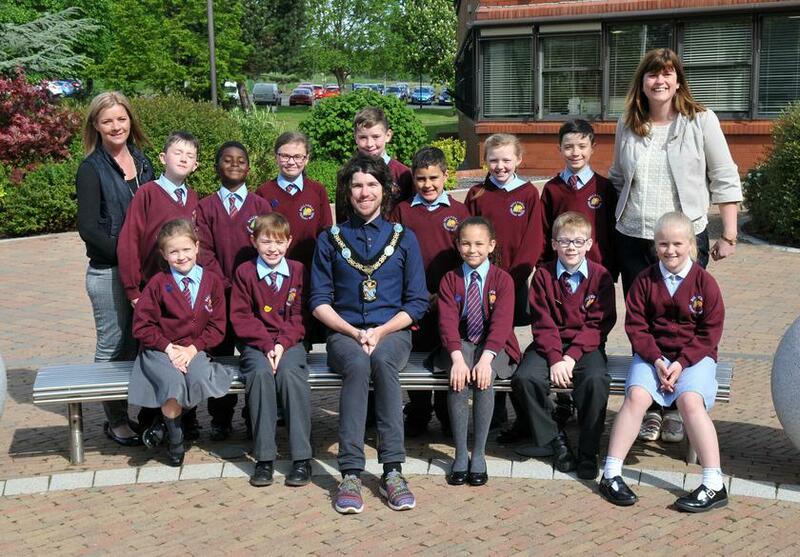 We were greeted by Susan Parks, who is the secretary to the Lord Mayor, and who helped arrange our meeting. 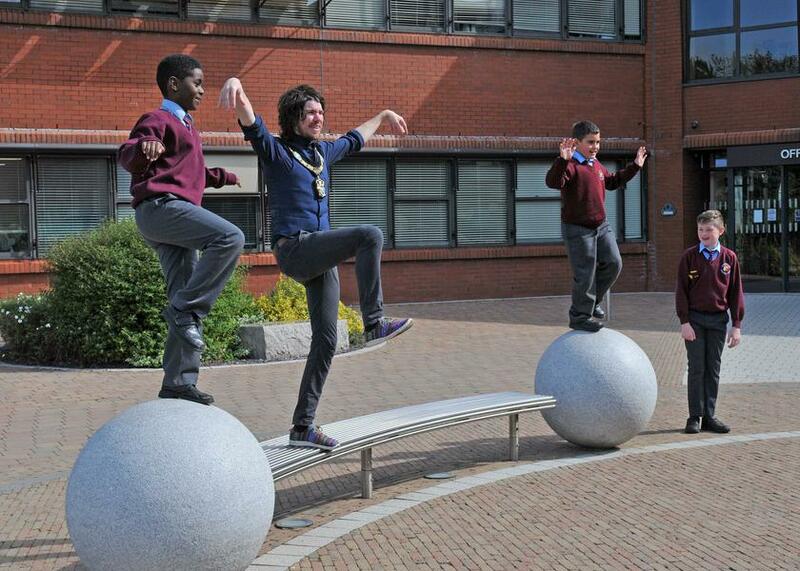 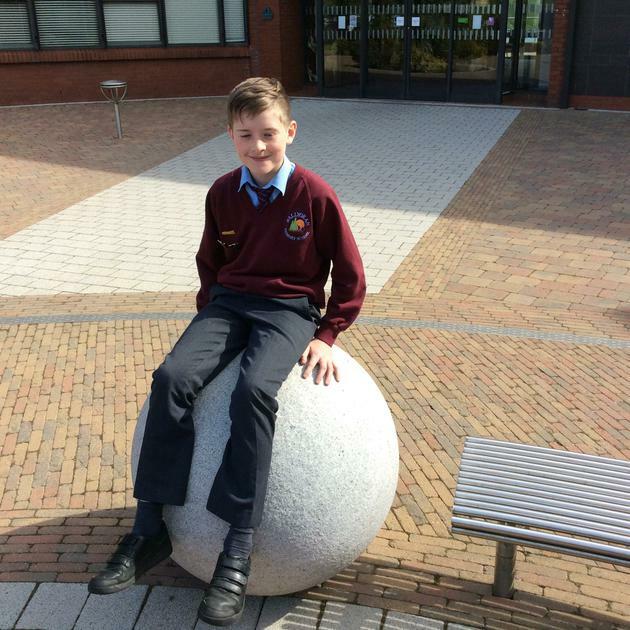 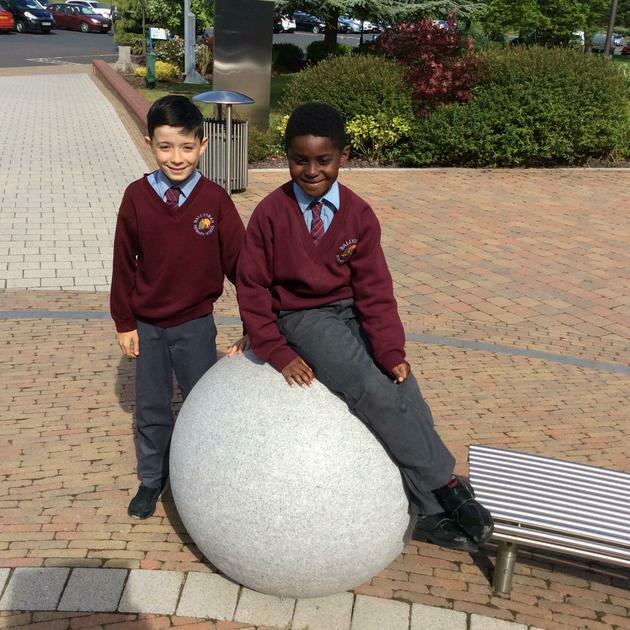 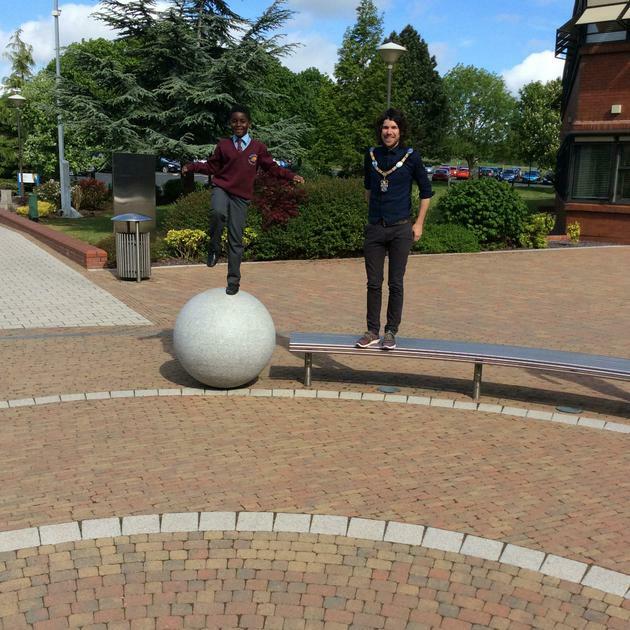 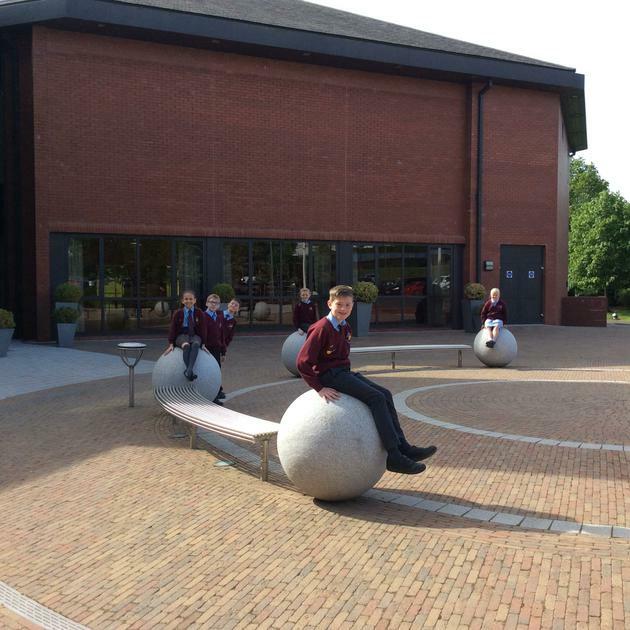 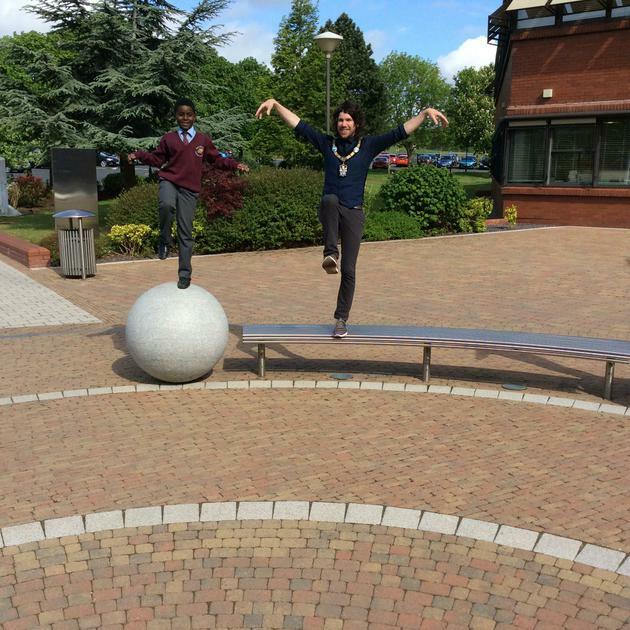 We stayed outside in the sunshine balancing on huge stone balls and benches chatting to the Lord Mayor, Mr Garath Keating. 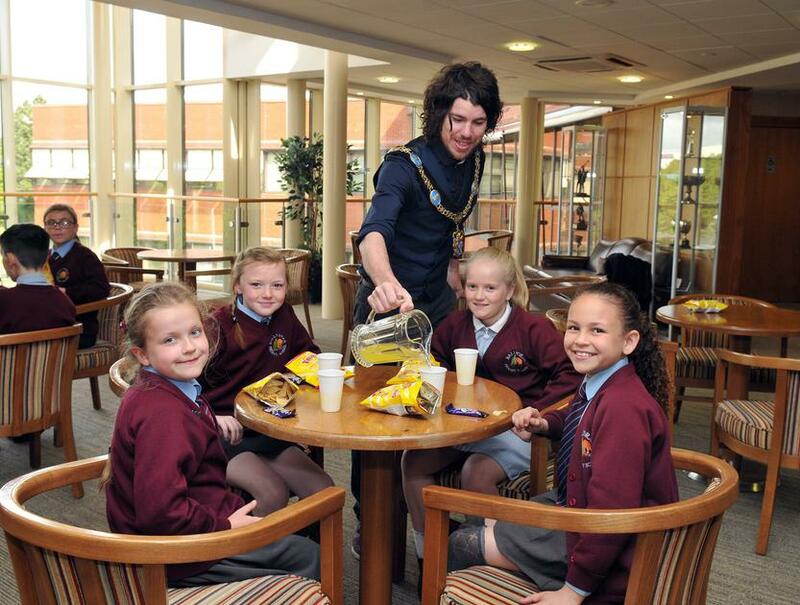 He then brought us inside a dining area where he chatted to us about school, football teams, Pupil Council and much more. 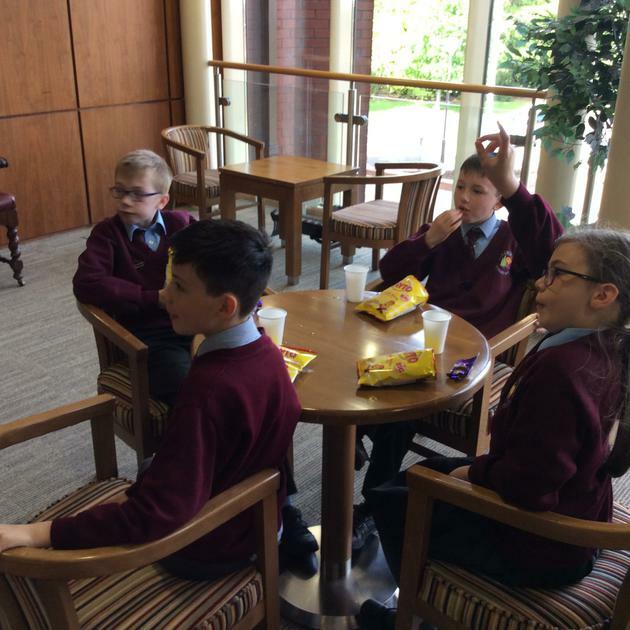 We even got a snack of crisps and a Freddo! 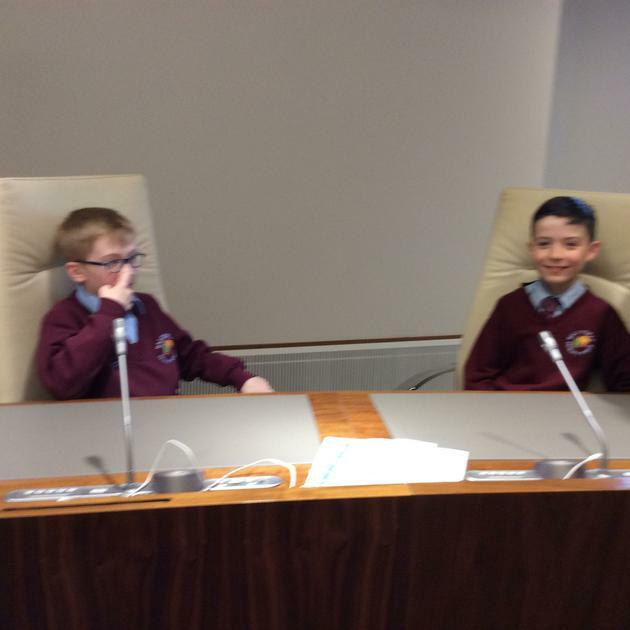 After we had all eaten we went into the Council Chambers, which was very grand. 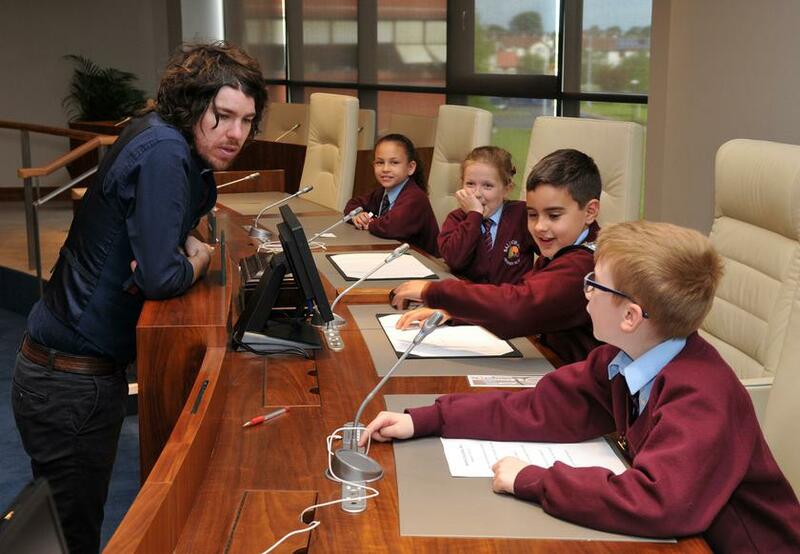 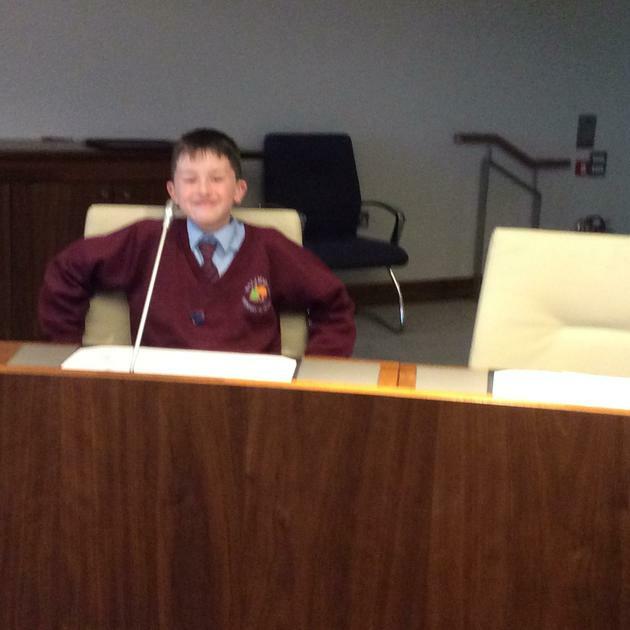 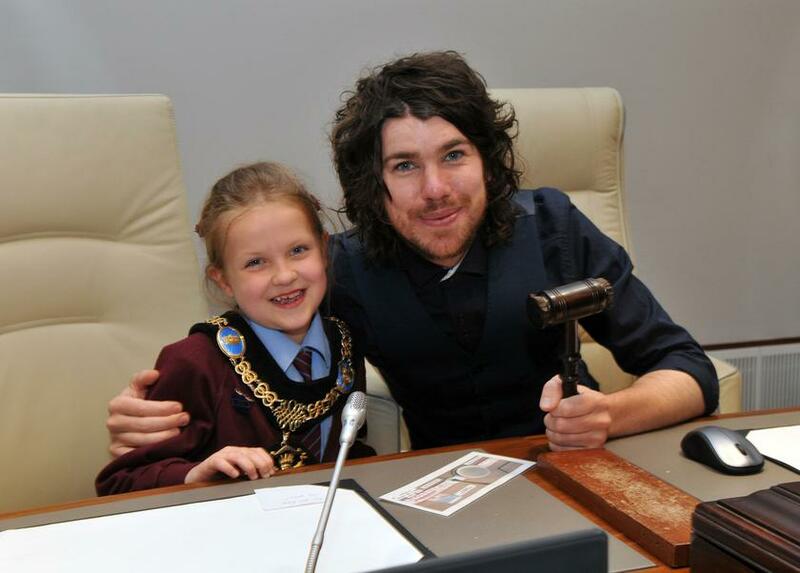 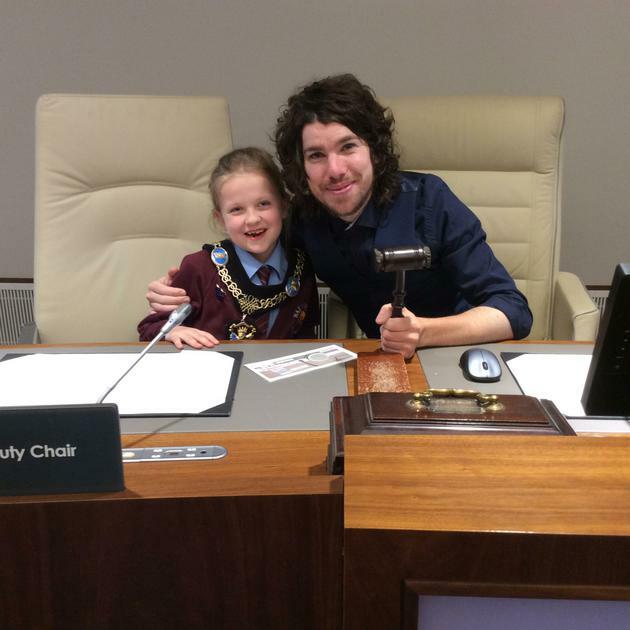 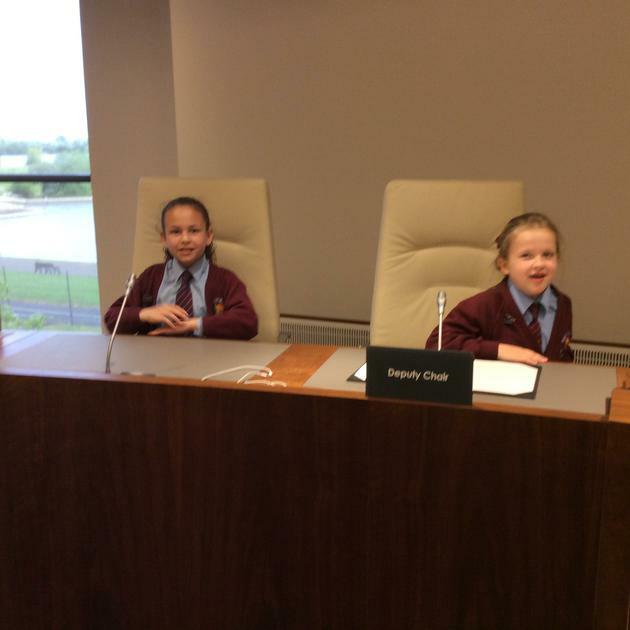 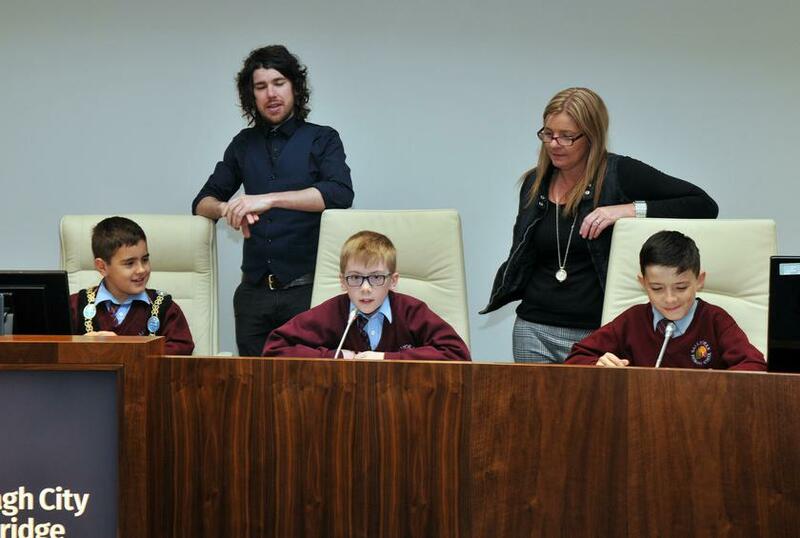 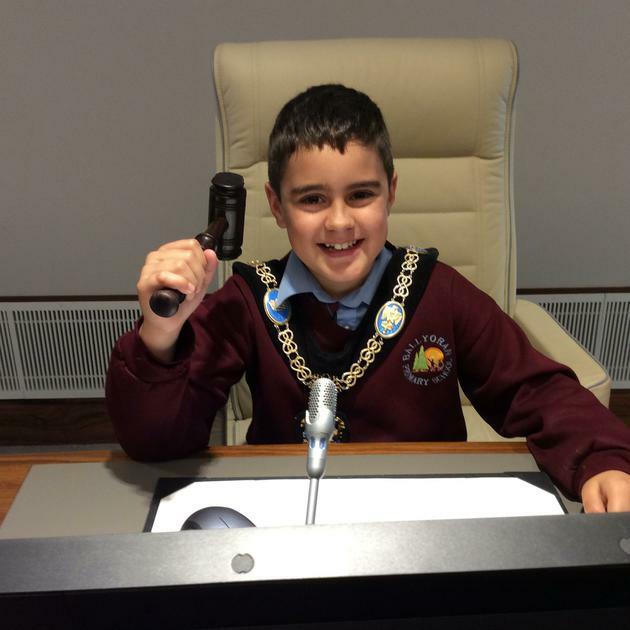 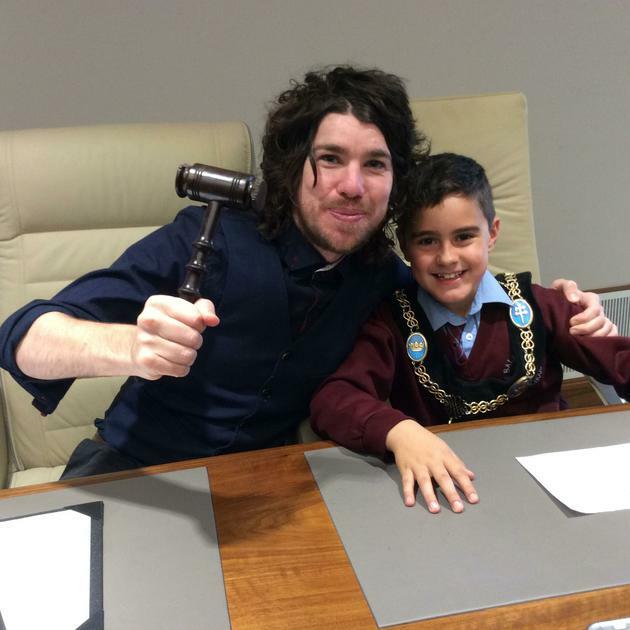 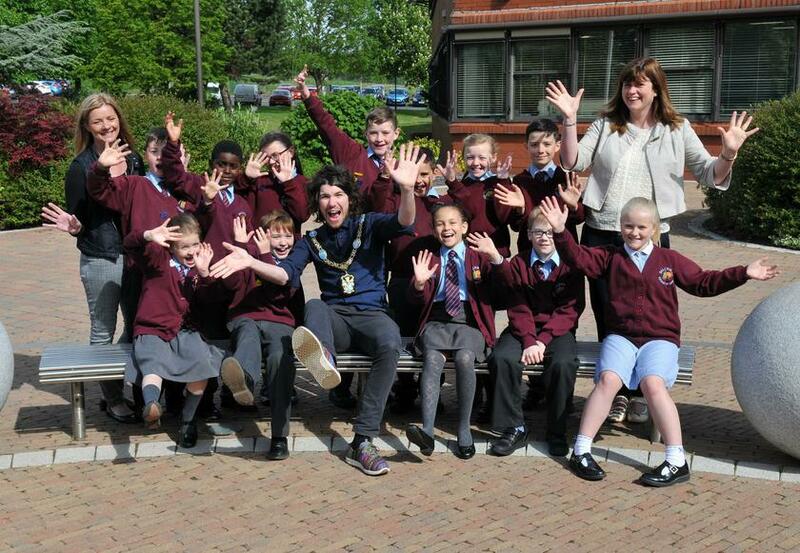 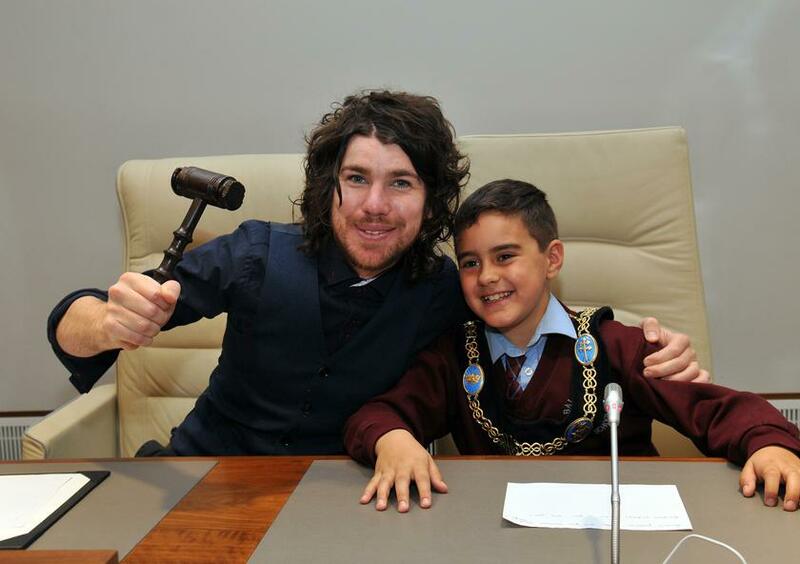 We used special microphones to speak and Brendan and Emma were mini Lord Mayors. 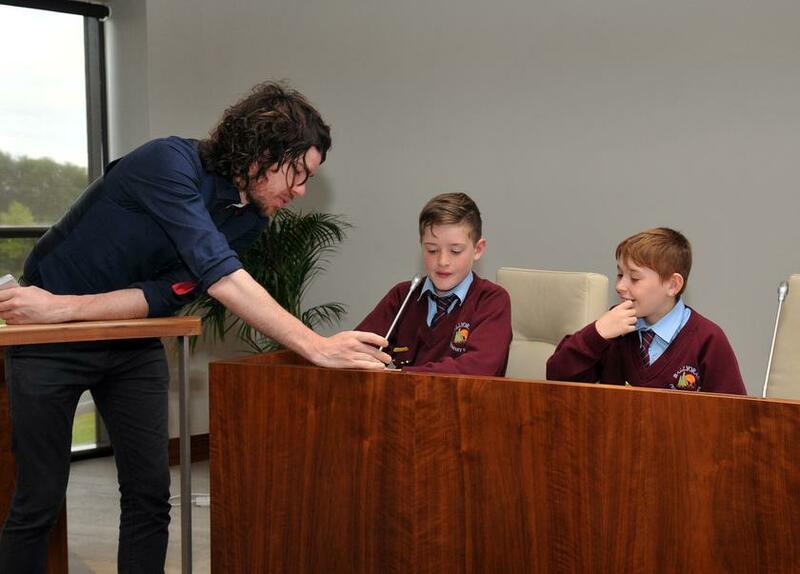 He spent a lot of time with us and made us feel very special. 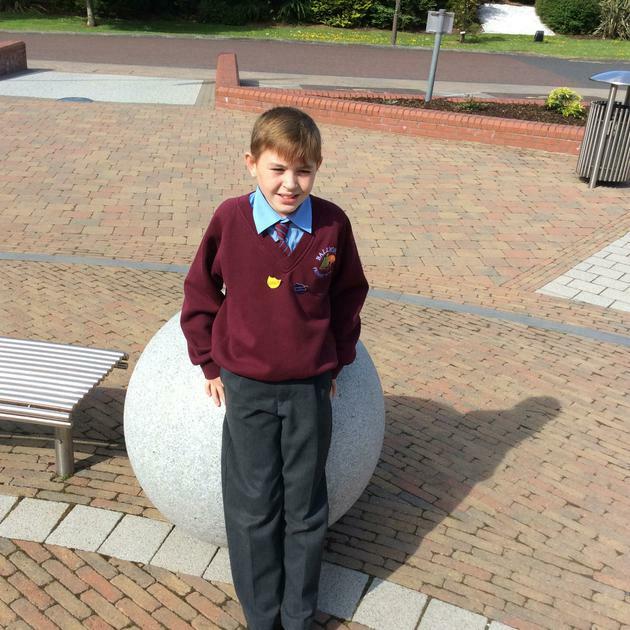 He even passed our bus on the Northway and beeped his horn at us on our way back to school. 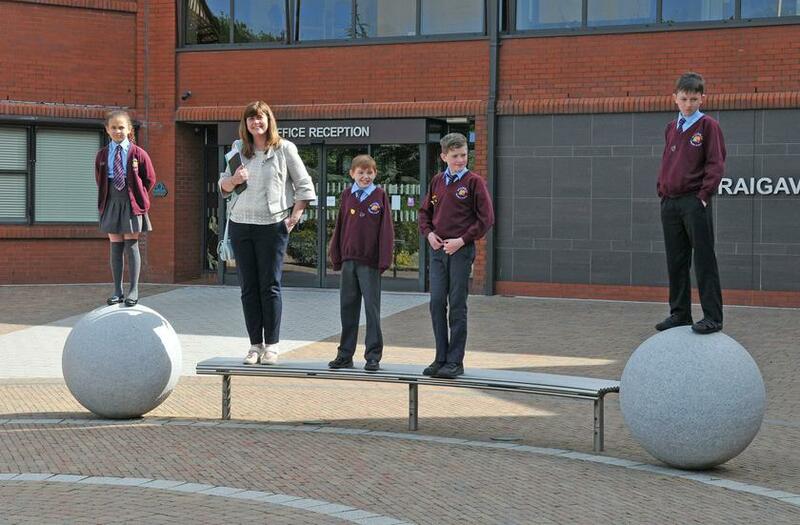 Mrs Martin was very proud of us as we behaved extremely well.